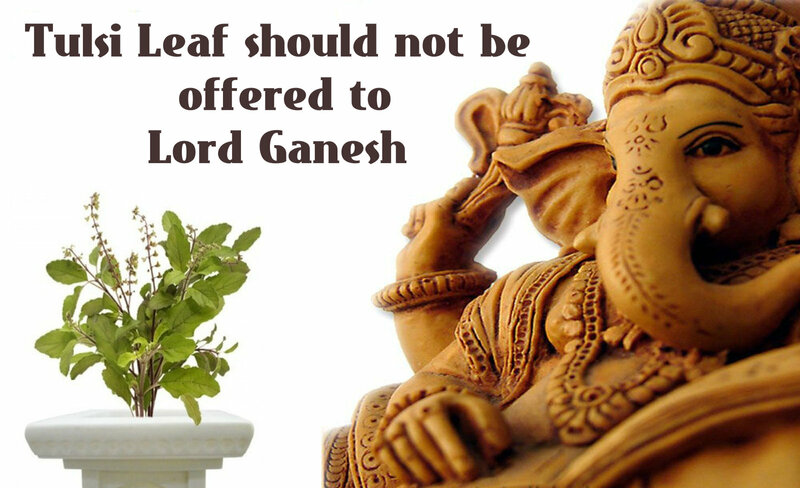 Why Tulsi Leaf should not be offered to Lord Ganesh?? Why Tulsi Leaf should not be offered to Lord Ganesh??? Tulsi, the daughter of Dharmaraja, the God of righteousness, was roaming about in the world in ecstatic devotion to Lord Narayana, in her youthful days and came upon the banks of the sacred river Ganga. There she wandered into a serene ashram full of fragrant flowers and plants swaying in cool breeze. She saw Lord Ganesha, who was in the prime of his youth, beautifully dressed in yellow silks, and lost in deep contemplation on Lord Krishna. Captivated by the beauty of Lord Ganesha, she entreated him to marry her. Lord Ganesha turned down the proposal, saying that he was least interested in married life. Tulsi became angry and cursed Him saying : “You shall surely marry !”, whereupon He also pronounced a countercurse on her : “You too shall get married, but to an Asura, and thereafter you shall be cursed to be born as a plant by the wise men”. Realising her mistake, Tulsi pleaded for mercy, and extolled Lord Ganesha with divine hymns. Lord Ganesha relented and said: “Though you shall be born as a plant, you willinherit the essence of all fragrance. All the gods will be happy with your fragrance, and Lord Hari will be specially glad to receive worship with your leaves. But you shall not be acceptable in the worship offered to me, except on Chathurthi days”. So saying, Lord Ganesha left that place and went to Badrikashram.